Vintage Adventurer | Day Three on the Road! Day Three on the Road! 17 Oct Day Three on the Road! This morning was an early start when we rolled off the Ferry and headed off to see our sponsors at ARB 4×4 Accessories and Penrite Oil. ARB have very generously provided us with some rubber de-bogging recovery tracks that fold up to briefcase size and will come in very handy up North. We are also hoping to catch up with Penrite Oil up at Surfers’ Paradise this weekend at the Castrol Gold Coast 600 where Penrite are sponsoringErebus Motorsport V8. 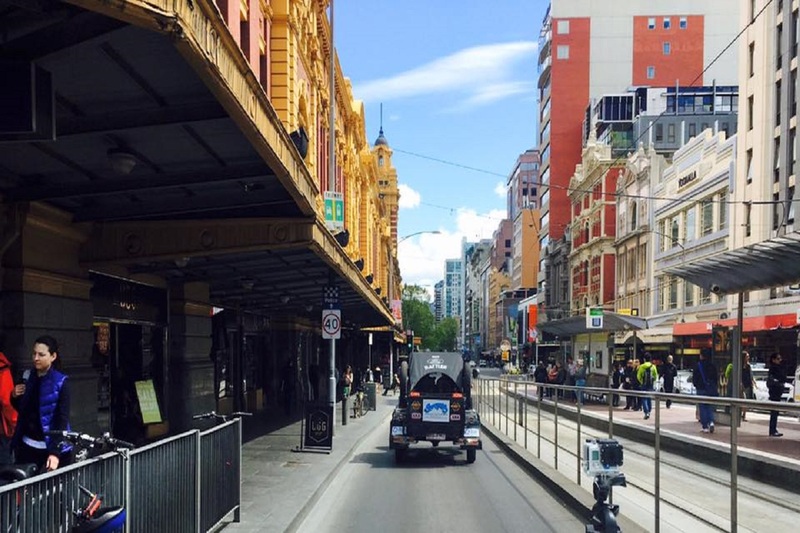 After checking in to our hotel for the night, I took The Rattler out for a drive around the City of Melbourne. This afternoon, I’m off to get a haircut so I’m fully ready for the heat up North! It might be a little cold in the morning, but it should soon heat up in a few days! I’m sure looking forward to celebrating my birthday on Wednesday when we are staying the night at Circular Quay in Sydney. Shhhh …. keep that to yourself ? ?